The FPC1220ABZ model features an orange flame and aged bronze (black) base. Photo sensor turns light on at dusk and off at dawn. Two light settings (off and flickering). Note: This candle does not have a steady burning setting. 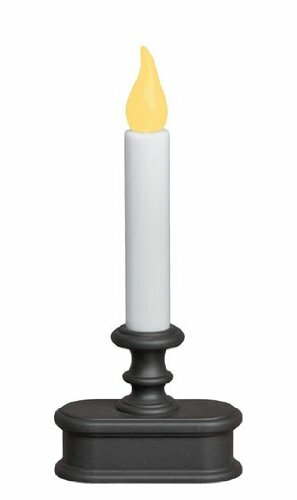 The Battery operated LED candle runs on 2 AA batteries (not included). The batteries will last 20 days when lit for 12 hours per day. LED light stays cool to the touch for safe operation all night long. Measures approximately 1.5 inches deep by 3.5 inches wide by 8.5 inches tall. If you have any questions about this product by Xodus Innovations, contact us by completing and submitting the form below. If you are looking for a specif part number, please include it with your message.